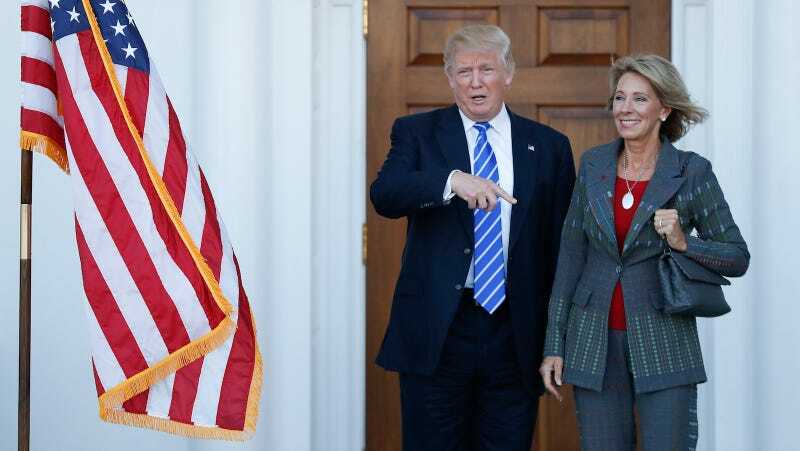 President-Elect Donald Trump has appointed Betsy DeVos as Education Secretary and, reportedly, Ben Carson as Secretary of Housing and Urban Development (Carson has not yet accepted), continuing to plow through his cabinet appointments with the grim determination and exactitude of a seven-year-old deciding which friends to include in his talent show performance. In New Orleans, two years after winning a private school voucher, the average student had lost 13 points of learning in math. The reasons why point to the shortcomings of the Trump proposal. The modest size of the voucher, about $5,500 in Louisiana, was not large enough to persuade the most exclusive private schools to accept a more challenging student population. Many of the private schools that did accept vouchers had experienced previous enrollment declines, indicating they were unpopular with parents who could afford to pay tuition on their own. And in DeVos’s home state of Michigan, a for-profit charter school insurgency in Detroit has led to what the New York Times called “a public education fiasco that is perhaps unparalleled in the United States,” with only 10 percent of rising seniors scoring “college ready” on reading tests. This all seems ominous enough, but, of course, there’s more. DeVos’s brother, Erik Prince, is the founder of Blackwater, one of the private security firms that operated during the Iraq War. He’s also close friends with Vice President-Elect Mike Pence. Last year, four Blackwater guards were convicted for shooting 31 unarmed civilians in Baghdad in 2007; the company, which Prince has left, is now called Academi. DeVos’s husband, meanwhile, is the heir to the Amway fortune, a “multi-level marketing” company that was the subject of a class-action lawsuit a few years back that called it a pyramid scheme. The DeVos family has been compared to the Kochs in terms of their influence on the modern conservative movement and the Christian right, pouring money into anti-abortion, anti-LGBT rights causes (they’ve donated, for example, to Focus on the Family, which supports conversion therapy); the Intercept notes that the Prince and DeVos families helped fund Newt Gingrich’s far-right House takeover during the Clinton administration, which created the framework for the burning building of vicious hyper-partisanship that we’re all currently trapped in. In other words, Betsy DeVos, who did not originally back Trump, represents a truly scary marriage of corporate cronyism, the Christian far-right, and Trumpism. Ben Carson, on the other hand, who is reportedly considering Trump’s offer to be the next Secretary of Housing and Urban Development, represents a marriage between two idiots. Carson, a former brain surgeon, creationist, and creative Trump lackey who just a week ago rejected a role in Trump’s cabinet on the basis that he has “never run a federal agency”—Carson ran for president—now appears to be more open to the idea, writing on Facebook today that “after serious discussions with the Trump transition team, I feel that I can make a significant contribution particularly to making our inner cities great for everyone.” Oh? It’s pretty clear what’s happening here, although it is nearly unbelievable; Ben Carson has absolutely no expertise on housing policies nor is he qualified for this position, but he is black, and exceptionally good at something (surgery), facts that lend credence to what the New Yorker’s Jelani Cobb calls his “exonerating racism,” if not to any actual qualifications. Now that Trump’s got a woman on education, maybe a telegenic guy named Ford on transportation, another telegenic guy up for Secretary of State, someone called “Mad Dog” in line for defense, a man named Forrest up for Department of the Interior, well, the gang’s all here! Lights, camera, action!